GSMC members have always been very active in transcribing the county's vital records for our many publications. We can use assistance transcribing at the courthouse (Wednesdays 9-12 and 1-4), proofreading records, or creating indexes. Or just come in to help us make copies! We have several other projects being worked on if you can't go to our archives or the courthouse. If you are interested in helping out with any of these projects, please let us know. ​Cemetery Transcriptions- Several of our members, including a few NEW members have been busy rewalking the county cemeteries to update the transcriptions. If you are interested in tackling a cemetery, please let us know! Some have already been done (Oakgrove and Pleasantview, thanks to Barb Roe! and Holy Ghost, Memorial Place, Doty, King, McIntyre, Trinity, Rath, Richardson, Maple Grove & Zion) and others are in progress (Lulu, London, St. Paul (in Maybee), and Maplewood in Ida (thanks to Grace Hudson!!)). If you are willing to spend a few hours walking a cemetery in the county or if you have access to sexton records, let us know! We'd love to add to our list of transcriptions. We are also updating our master cemetery index with any new burials since 1980 and correcting errors that were made in the original transcriptions. Marriage Index- We are copying and indexing the marriages that appeared in the Monroe Evening News. If you would like to help with this project, we can use folks willing to copy the articles from the microfilmed copies of newspapers at the library, type the records into Excel, or proofread the index from the typed sheets. Copies of the entries from the newspaper will be on file in GSMC's archives once the indexed records are completed and uploaded to our website. So far our index covers from Jan 1926 through 1947. These indexes include the marriages, marriage licenses, anniversaries, and births that appeared on the social pages of the Monroe Evening News. Thanks to Ray Dushane & Margo & Larry Zieske for spending the time copying the pages from the newspapers on microfilm, and to Barb Roe, Dave Rekuc, Mary Vergowven, and Marcia Nowland for typing the indexes. The indexes can be found under the Record Transcriptions on the menu on left- you are required to log in to access the files. Books containing the names found in the Monroe Evening News marriages, anniversaries and births from Jan 1940 through Dec 1944, Jan 1935-Dec1939, Jan 1930-Dec 1934, and Jan 1926-Dec 1929 have been published. If you are interested in purchasing a copy, please contact GSMC to reserve a copy or stop in to our archives on a Wednesday between 11 and 5. 1812 Soldier Database - Lucy Pitcher is compiling a list of 1812 soldiers from Monroe County from various sources. The database will be similar to that created for our Civil War soldiers. If you have information about a Monroe County 1812 soldier, please contact Lucy to ensure his information is added to our database. Records being checked include probate, pension, and church records. Copies of all records will be on file in the archives when this project is completed. Master Cemetery Index- the indexes for the cemetery transcriptions done by Frieda Kellie and Shirley Keehn in the late 1970's and early 1980's are completed with almost 50,000 entries. We have added thousands of names to our cemetery index from transcribing several county cemeteries. We have over twenty new cemetery transcriptions, with more in the works. The Master Cemetery Index contains over 71,000 records now! The Master Cemetery Index can be found under Cemetery Records. This index is of the transcriptions done in the 1970's and 1980's.... except for Roselawn and the 30 or more newly transcribed cemeteries. See the list under Record Transcriptions on left menu. King's Notes Update- in 1979 the Museum published the notes of Jason King who had amassed a huge collection of information about the Civil War soldiers who lived in Monroe County. Jason died before he could finish his project, so the museum published his NOTES, hence the name of the book. Much more information is available to researchers (especially on the internet) so we have updated the book with the Friends of the Museum as a fund raiser for the Monroe County Historical Museum. There are over 2500 listings in the database and we now have folders for all of them in the Monroe County Historical Museum!!. 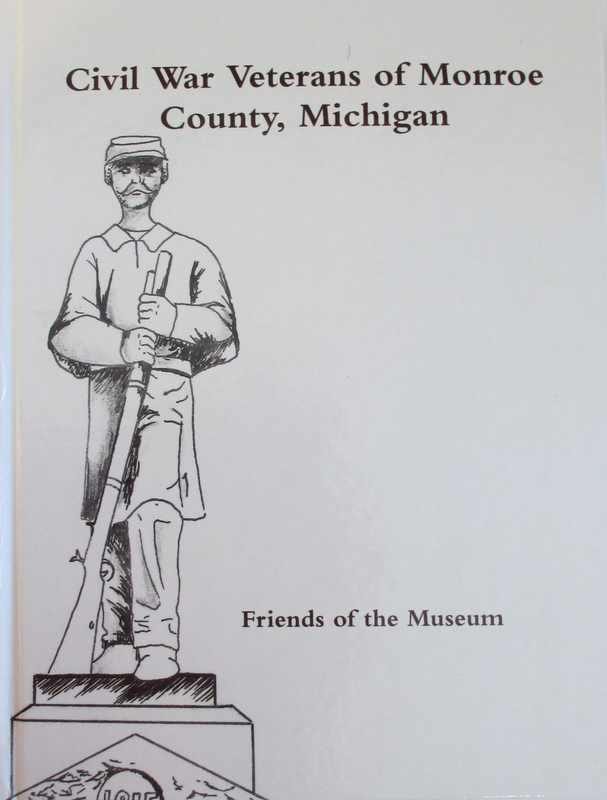 The Civil War Veterans of Monroe County, Michigan is now available for purchase!! Each hard bound book contains information on ~2500 Monroe County Civil War veterans, including a short biography of his life and details on his military service. Most have death dates, location, and burial sites. The book is 470 pages and contains photographs of over 20 of our county's soldiers. Cost is $35. Books are available at the museum. Special thanks to Emily Phillips for the artwork on the cover and inside the book and to the many members of GSMC (especially Lucienne Pitcher and Loretta Dunham) for assisting the Friends of the Museum in compiling this volume. To purchase a copy contact Chris. See the flyer for more details. We are still collecting information about these soldiers to add to their files in the museum. Hard copies of the information we have found on these soldiers can be found in the files in the Monroe County Historical Museum. Be sure to stop by the museum to see the collection we have amassed on the men from Monroe County that served our country during the Civil War!!! Most have death and burial information, and many have actual pension files in the folder thanks to our generous members.